Horizon: Zero Dawn is right up there amongst the best video games I’ve ever played. It is phenomenal. I remember seeing an E3 or such trailer a fair while ago now and since then eagerly anticipated it’s arrival. I couldn’t get it when it first came out in the UK but I’ve now had it a couple of weeks and I have loved every moment of it. Usuaully I stick to what I know with things like Final Fantasy. Assassins Creed was a step up for me and it took me a while to get it but I loved it. I am also hugely into the Lego video games which are great fun! Horizon: Zero Dawn is such an enjoyable, fun and exciting game, I’m really glad I got into it. When it comes to video games my skills are pretty limited. I have been known to rage quit after losing too many times, dying too many times and complex controls baffle me. I was a little apprehensive of this game because I really wanted to play it but worried the controls would get the better of me. They didn’t. Thankfully. And I’ve really enjoyed playing through the gorgeous landscape of what used to be the USA. 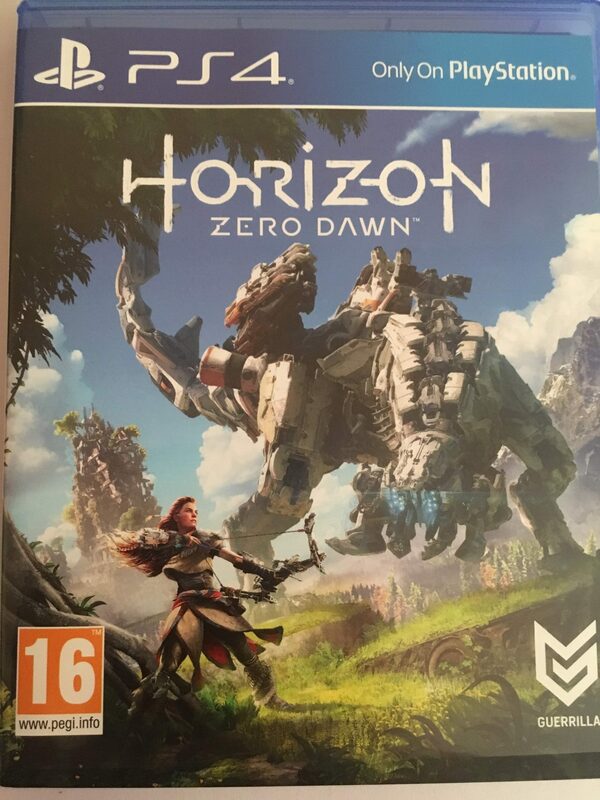 Horizon: Zero Dawn takes place many, many years in the future where the world is segregated and over run by machines. You play as Aloy, a young tribal woman that was outcasted at birth for reasons she is yet to discover. She is raised by another outcast, Rost, who is very much a father figure to her. Through the prologue you learn how to hunt, how to stealth avoid beasts and a little bit of the world that was. Throughout the game you go through an unexpected and incredible journey through mountains, deserts and jungles. The gameplay is fairly simple and the tutorials make it easy to pick up and understand – I was thankful for this. Throughout the game you can develop character skills, modify weapons and outfits, learn to use the environment around you and create strong ammo for the tougher machines you will set out to kill. Through Aloy’s quest you find out more about the world that was and how it came to be how it is now. The graphics are simply stunning in Horizon and the amount of detail in the smallest things is incredible. Nothing has been left out and it’s so easy to see why the game has been so well received. The characters you meet along the way are intriguing and likeable. The enemies pose tough battles. The player has an amount of control over the responses Aloy gives which gives it an interactive feel. I have nothing negative to say about this game. It’s amazing and I am really loving it. It’s given me a bit more confidence in my gameplay abilities and the courage to try newer games that might be a little different. I’m currently enjoying tying up lose ends with some of the side quests and exploring more of Horizon’s world. If you enjoy open world adventure games with thrilling action based and stealth combat then I think you might just love this.